Maybe that’s why none of the gospels give us an actual description of the event itself. Artists have tried to picture it, of course, but that’s art - highly imaginative art. We have nothing either visual or verbal that depicts the actual event of Jesus’ resurrection. What we do have, however, both visually and verbally, are the resurrection’s effects – first of all on the disciples, and then on the world, and finally on us. Its effects on the disciples are what we read and hear in the gospel stories of the visits to an empty tomb and then later of the appearances of the risen Lord – and still later in the preaching of Saint Peter and others in the Acts of the Apostles and in the amazing response of those who heard their preaching, and finally in the testimony and letters of Saint Paul, who wasn’t there at all at Easter, but who eventually experienced the risen Lord himself and was forever changed as a result. Its effects on the world were immediately evident in the short term in the enthusiastic response of Jews and pagans alike to the amazing story the apostles told. In the long term, its effects have been equally dramatic in how the story has spread and the Church has grown as a result, in the dynamism that is at the heart of the Church’s existence in the world and that has propelled it outward in almost 2000 years of world-transforming activity. Homily for Easter Sunday, Immaculate Conception Church, Knoxville, TN, March 31, 2013. In The Sign of Jonas, Thomas Merton (1915-1968) wrote of Holy Saturday: "The Night Office of this day is bewildering. The confusion of sorrow and joy is so complex that you never know where you are. The responsories might have been composed by James Joyce All the associations of terms and symbols are thrown into confusion. One responsory starts out with Jerusalem ... and you are all set to be glad, and you are told to mourn. Then in the end, speculatively, you find that you are saved. This is the product of the historical curcumstances through which the Holy Saturday liturgy has passed"
Merton wrote those words on April 15, 1949. He was referring, obviously, to the un-reformed Holy Saturday liturgy of those days. Of that un-reformed state of afairs, Philip J. Goddard, himself no great fan of our contemporary liturgy, has written: "Over the course of time the most important liturgical function of the entire year had become, so far as the faithful were concerned, merely a series of arcane and largely incomprehensible rites carried out very early in the morning by the clergy in churches empty of all except the odd liturgical enthusiast. It also involved the anomaly of celebrating the first Mass of Easter before the formal conclusion of Lent at midday. It is something of a wonder that this indefensible state of affairs was allowed to continue for so many centuries before the celebration of the Vigil was restored to its proper time." (Festa Paschalia: A History of the Holy Week Liturgy in the Roman Rite, 2011, p. 278). It may have been an "indefensible state of affairs," but it has certainly left its mark on the character of Holy Saturday. Pius XII's 1955 reform aimed at setting that all right again, but of course, human behavior is hard to change. The new rubrics were dutifully observed, and more people than in the past (but probably nowhere near so many as on Holy Thursday and Good Friday) attended the restored Vigil. On the other hand, the idea of Holy Saturday as an "aliturgical" day never really caught on. The Easter Vigil, which was theoretically supposed to end with a Mass starting at about midnight, was widely anticipated at the earliest legally allowable hour (as early as 6:30 in one cathedral in the 1960s). This made for greater convenience, of course, for those reluctant to be out so late at night (even at a time when people were still flocking in great numbers to Midnight Mass at midnight on Christmas). It meant that decorating churches with elaborate Easter floral arrangements could be done late Saturday evening instead of sometime after midnight. Most of all, it created the idea - or rather re-inforced the existing older idea - that the Easter Vigil was a liturgy of Saturday rather than of Sunday. It's quite clear in the current rite that Holy Saturday is the second day of the "Easter Triduum," and that the Easter Vigil is part of Easter Sunday, the third day of the Triduum. But that too is largely just jargon to "all except the odd liturgical enthusiast." It hardly helps that in the current rite the Vigil is really somewhat vestigial, and the ceremony appears essentially structured as an extra-long Saturday evening Mass. It's eminently understandable, of course, that, back when Lent was taken seriously as a season of fasting, people were tired of it by then and eager to anticipate Easter a day early. And, despite the effective abandonment of Lenten fasting, that same mindset still seems to perdure today. So this morning - after dutifully celebrating the Office of Readings and Morning Prayer in the church, at which we heard the Office's wonderful ancient homily depicting Christ's descent to the domain of the dead - I enjoyed a big buffet breakfast next door, before joining my dedicated parish volunteers in a morning of festive decorating. Then this evening, when it is still very much Saturday in our ordinary way of thinking, we will ring bells and sing Alleluia. It is a very strange day indeed - but wonderful in its own way! I've always liked the old name for Good Friday, which it had until 1955 - Feria sexta in parasceve ("Friday, the Day of Preparation"). By New Testament times, the term had become standard - at least among Greek-speakign Jews for Fridays and the eves of major festivals like Passover. John's Passion narrative, which we will hear later today, uses the term to refer to the day of Jesus' death, making it clear that Jesus died onn the afternoon of the 14th of Nisan, the eve of Passover, indeed at roughtly thew hour at which the Passover lambs were being sacrificed in the Temple. The paschal character and symbolism of Jesus' death was thus empahsized in John's account, which has guided the liturgical observance of Holy Week for most of the Church's history. Popular devotions - e.g., the Stations of the Cross - while admirable and spiritually very effective - have a certain incompleteness about them. they tend to focus on only one aspect of the Easter story - e.g., the passion and death of Jesus - detached fromt he totality of the story. The liturgy itself, however, never did that. (At least the pre-1970 liturgy never did that.) For centuries until 1969, the account of the institution of the Passover (Exodus 12:1-11 was read at the Good Friday litrugy, clearly connecting the Passion account which followed (and indeed the entire day) with the paschal mystery. Until 1955, that reading was also repeated at the Easter Vigil, further bringing home the connection. The 1970 lectionary moved the Exodus reading to the Mass of the Lord's Supper. Liturgical cognoscenti might well think of the Mass of the Lord's Supper as a kind of "1st Vespers" of Good Friday. (It is, in fact, the official beginning of the 1st day of the Triduum, which ends with the Liturgy of the Lord's Passion on Good Friday afternoon). For most modern people, however, Thursday and Friday are separate days. Few are likely spontaneously to see a connection between the Exodus reading and Friday's Passion account. And the common replacement of the Pange Lingua durign the Good Friday Veneration of the Cross with popular passion hymns like O Sacred Head or, worse, Were You There? further detaches Good Friday from its Easter connection and turns the whole day into just a historical anniversary of Christ's death. Back in the 1950s, Good Friday was a popular semi-holiday. A lot of people got off work early, and in the immediate aftermath of the 1955 liturgical reform churches were often filled for the liturgy of Good Friday afternoon (and often as well on the evening before for the Holy Thursday Mass). Of course, even then a free afternoonwas for many an opportunity for shopping. Now, however, it has increasingly become the beginning of a long holiday weekend, with the obivous effect on attendance at the liturgy of the day. Another casualty, of course, has been Tenebrae, which in its modern, morning verison has never quite caught on the way the older, afternoon version did. There were only seven of us there this morning, but we still snuffed the candles (see photo) and so started in a good spirit this special day - this "Day of Preparation" for our renewed appreciation of our participation in Christ's resurrection. For as long as Easter has been celebrated it seems there have been disputes about its date. Despite the widespread desire for liturgical uniformity, Easter has more often than not been celebrated on different dates in different places. Thus, St. Ambrose (340-397) mentioned in one of his letters that, in the year 377, Easter was celebrated on at least three different dates - March 21 in Gaul, April 18 in Italy, and April 25 in Alexandria. The Western Church would not in fact achieve the desired unity of Easter observance for a few more centuries. To this day, as is well known, the Eastern and Western Churches continue to celebrate Easter on different dates – every once in a while on the same date, occasionally a month apart, in most years one week apart. This year is one of those years when the Western and Eastern Easters are a full month apart – March 31 and May 5 respectively. Thus it was with great interest and some surprise that I read that Catholics in Israel, Jordan, and Cyprus will be celebrating Easter together this year according to the Julian calendar along with their Orthodox neighbors. Apparently, this follows a 2012 decision by the Holy Land’s Catholic Bishops, to be implemented ad experimentum this year. This surprising decision will, however, thankfully have little effect on the many pilgrims from around the world, who will assemble to celebrate Holy Week and Easter at the traditional Holy Places in Jerusalem. The so-called “Status Quo” arrangements which regulate the different Christian communities’ usage of the Holy Places in Jerusalem and Bethlehem will keep the Catholic Easter celebrations in those cities on their Western dates. (Indeed, those same regulations require the celebration of the Latin Holy Week services to occur at their pre-1956 times –e.g., in the mornings of Holy Thursday, Good Friday, and Holy Saturday). Of course, the most fundamental dating issue about Easter has always been the apparent disagreement between the Synoptic Gospels (Matthew, Mark, and Luke) and the Gospel of John. The former seems to portray the Last Supper as an actual Passover meal, while John very clearly indicates that the Last Supper was eaten before the feast of Passover and that Jesus’ crucifixion occurred on the Day of Preparation – indeed at the hour the Passover lambs were being slaughtered in the Temple. Hence, the reference (John 18:28) to the authorities’ refusal to enter Pontius Pilate’s praetorium lest they become ritually disqualified from eating the Passover (which obviously means they hadn’t already eaten it the evening before!). 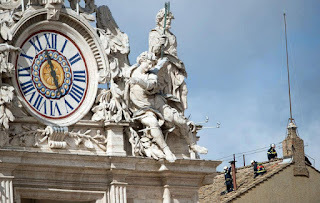 In his 2011 Holy Week book, Pope Benedict XVI noted that “it is becoming increasingly clear that John’s chronology is more probably historically than the Synoptic chronology” (p. 109). Certainly the Synoptic dating, which would suggests Jesus’ arrest, trial, and execution all took place on the holiday, seems presumptively implausible. And John’s chronology has been the one implicitly followed by the Church’s liturgy. (St. Paul’s “first fruits” imagery in 1 Corinthians 15:20 also seems to harmonize nicely with John’s dating). Thus, prior to the new 1970 lectionary, there no references to the Passover in the Holy Thursday Mass of the Lord’s Supper (other than the opening words of the Gospel which explicitly begins Before the feast of Passover …). Good Friday, however, on which John’s Passion Gospel has traditionally been read, was full of Passover symbolism – starting with the original 2nd Reading, Exodus 12:1-11, the familiar account of the first Passover in Egypt. (In 1970, this reading was inexplicably moved to become the 1st Reading for Holy Thursday). In past years, whenever I have celebrated the Mass of the Lord’s Supper, I have preached about the Eucharist, the priesthood, and the other obvious themes that Holy Thursday suggests, but I have always avoided any references to Passover. Just the opposite, on Good Friday I have usually used that day’s Gospel’s Passover imagery as a major reference point in preaching. That the gospels invest the Last Supper with Passover motifs is undeniable, nor should it seem at all problematic. It may, however, be problematic if we start getting focused (as our symbolically starved, fundamentalistic modern style may incline us to focus) on the Last Supper as a sort of “Christian seder.” That can lead to all sorts of liturgical abuses (which were not exactly unknown back in the 1970s). Such an approach may diminish the ability to appreciate the actual Passover seder’s authentically Jewish character. (On the other hand, I’m all for Christians attending actual seders, if invited, or even having demonstration seders - apart from the liturgy - as a way of learning about both biblical and modern Judaism). And it is not just the authentically Jewish character of Passover which we may risk not appreciating, but the Christian Passover as well. Liturgy and tradition have always spoken of Easter as the Christian Passover. As if to bring that point home, the traditional Easter Vigil repeated Exodus 12:1-11, and even the contemporary ritual still retains the powerful account of the deliverance of the Israelites from the Egyptians at the Red Sea Exodus 14:15-15:1. It is, after all, on Saturday night – not Thursday – that the Church will exultantly proclaim: These then are the feasts of Passover, in which is slain the Lamb, the one true Lamb, whose Blood anoints the door-posts of believers. This is the night, when once you led our forebears, Israel’s children from slavery in Egypt and made them pass dry-shod through the Red Sea. Today, I am officially a "senior citizen." To me that's really a big deal - and not just because of the discounts we seniors can qualify for! 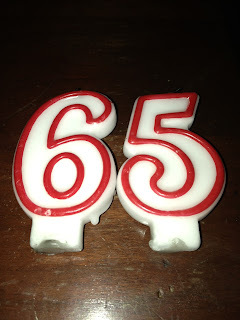 It wasn't so long ago, after all, that merely making it to 65 was itself an accomplishment. (It also wasn't so long ago - before social security and medicare - that old age correlated highly with poverty, something also not the case now). Of course, if I could have the looks, the health, and the physical strength of a 25-year old, I'd be crazy to turn them down. But life doesn't make such offers. And the fantasy of combining the looks, health, and strength of a 25-year old with whatever wise lessons 65 years of living have taught is just that - a fantasy. I can only be who I am, which is to say who I have become by the inscrutable accidents of birth and time, combined with the multitude of many short and long-term choices made, and habits formed, and relationships bult - and broken - over the course of that same time. When I think of myself as part of a generation (the earlier cohort of the post-war Baby Boom ), it's naturally tempting to focus on the the big picture stuff - all the great geopolitical and sociocultural transformations we have lived through and have been active participants in. In fact, while lots of really good stuff has happened in the world that our generation has been part of, the overall dynamic of change has been ruthless. That was already becoming threateningly evident only one-third of the way through my generation's journey. Back then (in the exciting and catastrophic year 1968), Norman Cousins is supposed to have said: “The trouble with trying to penetrate the vitals of the past quarter century is that 1940 was more than a hundred years ago. Into a few decades have been compressed more change, more thrust, more tossing about of men’s souls and gizzards than had been spaced out over most of the human chronicle until then. The metabolism of history has gone beserk.” If anything, the subsequent two-thirds of our generational journey have confirmed that insight and exacerbated it beyond anything imaginable in 1968. In some ways, I'd say the world today is even more unlike the world of 25 years ago than that year (1988) was unlike 1968! So much change, so rapid, and so substantial exacts a terrible toll on society, although on the whole our generation has managed to navigate the way well enough. It is rather those good looking, healthy, and strong 25-year olds - the Lost in Transition generation (to borrow the title of a seriously must-read, recent book about "emerging adults") - it is they that are having to pay the price, the very high price, of a civilization that increasingly has lost its moorings. When I think of myself as an individual, however, I admit to more continuity than change. I am still very much the person I was at 20 or 25, at 30 or 40 or 50 or 60. Of course, circumstances have changed with time, important friendships have flourished and died, opportunities have come and gone, while successes achieved have been matched by the most dramatic and lasting failures. Yet, for all the physical and emotional wear and tear of aging and all the lessons learned (and hopefully true wisdom achieved), I still recognize my same self through it all. When at age 33 I applied for admission to my religious community, I attempted to articulate - sincerely if also a bit awkwardly - a sense of providential grace guiding me through the ups and downs of life and leading me in a definite direction. I still feel that way today. (One of the things that then and since has so attracted me about the life and spirituality of Isaac Hecker was how he had a similar sense of providential grace and the great good he was able to accomplish as a result, in spite of external opposition and personal limitations). I have, however, over time, learned to trust the lessons of my own experience perhaps even more than I was earlier at ease doing. While I owe a lot to older acquaintances, among them mentors and guides now gone from the scene, I realize, especially when it comes to respecting and trusting experience, how blessed I have been by younger acquaintances, colleagues, and friends from whom I have also learned so much that is so significant. In his Palm Sunday homily yesterday, Pope Francis said two things that especially resonated with me as I celebrate this special moment in time - in my time. The first was addressed to everyone. "Do not be men and women of sadness: a Christian can never be sad! Never give way to discouragement! Ours is not a joy born of having many possessions, but from having encountered a Person: Jesus in our midst; it is born from knowing that with him we are never alone, even at difficult moments, even when our life's journey comes up against problems and obstacles that seem insurmountable, and there are so many of them!" The second thing I took from his homily was addressed to the young (in reference to World Youth Day): "we must live the faith with a young heart, always: a young heart, even at the age of seventy or eighty. ... With Christ the heart never grows old!" Like the other Passion accounts, Saint Luke's account of the Passion, which we heard at Mass this Palm Sunday morning, contains Jesus' prediction of Peter's denial, but precedes it uniquely with Jesus' special instruction to Peter: "Simon, Simon, behold Satan has demanded to sift all of you like wheat, but I have prayed that your own faith may not fail; and once you have turned back, you must strengthen your brothers" [Luke 22:31-32]. There are several "commissionings" of Peter in the Gospels - from Jesus's call to Peter to become a "fisher of men" in Luke 5, to his promise to Peter of the power of the keys in Matthew 16, to the final conferral of the primacy with the command to "feed my sheep" in John 21. The latter two especially tend to get the most attention, but they all go together and are all part of one overall commisioning of Peter as leader of the apostles and of his successors as popes for the Church. There is a progression in the "commissionings" of Peter - from evangelizer in Luke 5 to chief teacher and governor of the Church in Matthew 16, to principal pastor in John 20. The commissioning in Luke 22 (easily passed over in all the other words and actions of the passion narrative) represents, I think, another take on "feed my sheep." It too highlights Peter's shepherding mission. Ultimately, caring for the evangelized entails keeping them so, which then becomes the challenge of ongoing pastoral care in the life of the Church and the mission of the "new evangelization." In this time of heightened interest in the Petrine ministry, thanks to the election of a new pope, Jesus' Last Supper words to Peter - in the context of Peter's imminent denial of Jesus - take on a special significance. For the Pope does not simply govern the Church. He shepherds her - and her members - as they experience weakness induced by the multiple temptations and stresses of contemporary life. Commenting on this text at a Jubilee Year celebration for the Roman Curia on February 22, 2000, Blessed Pope John Paul II said "the Petrine ministry is not founded on human abilities and strengths, but on the prayer of Christ who implores the Father that Simon's faith 'may not fail'." Holy Week, for those of us who live and work in full-time parish ministry, may have a way of getting excessively hectic and seemingly out of one's abillity to manage one's timel. That was certainly the case in my experience in seminary where everything - and especially Holy Week, tended to be overdone. However, that was int he 1980s. On the other hand, it has been my experience since then that, with proper planning (and the necessarily familiarity in advance with what actually needs to be done), one can actually find time to devote - as one should devote - to one's own spiritual appropriation of Holy Week. In that spirit, having spent much of the morning helping redden the church and getting the palms ready, and the Passion books ready, etc., I have this Palm Sunday Eve begun re-reading Pope Benedict XVI's 2011 Holy Week volume of his Jesus of Nazareth trilogy. Benedict begins his treatment of the Palm Sunday story by linking the immediate goal of Jesus's journey to Jerusalem, his geographical ascent to the Holy City, with his ultimate goal of his priestly self-offering in his ascent to the Cross. Of course, even more obviosuly that the biblical texts themselves, the liturgy leads us in that direction directly by its juxtaposition of the palm procession, recalling Christ's triumphal entry into Jerusalem and the Mass that follows, focused completely on the Passion account. Twenty years ago, on what was my second day in Israel, my former novice director took me to a village in Samaria for the 1st Mass of a newly ordained local priest. We all gathered at the village boundary around an arch of palm branches and balloons and waited there for the new priest’s entry into his hometown. As the procession began and all the villagers started shouting and waving palms in the air, my former novice director smiled and said: now you see what Palm Sunday looked like! (Presumably without the balloons!) The new priest's triumphal entry into his hometown was on foot, but Jesus entered on a donkey, which, Benedict reminds us, represented an acting-out of the enthronement ritual of Davidic kingship - thus pointing to the Messianic hope associated with David. I think Palm Sunday gives us a good look at the ambiguity of that messianic hope, seemingly shattered shortly thereafter on the Cross, only to make way for a more all-encompassing kind of hope which no one in the Palm Sunday crowd - either the disciples or the pilgrims who joined in the acclaim for Jesus - could yet have anticipated. We are so used to Holy Week that I wonder whether we really recognize how full of surprises it is! Benedict's book, besides illuminating so many interesting features in the story, situates it firmly in relation to our own Holy Week. The early Church, he points out, read the Palm Sunday story as an anticipaiton of the Church's liturgy. "Just as the Lord entered the Holy City that day on a donkey, so too the Church saw him coming again and again in the humble form of bread and wine. ... As pilgrims, we go up to him; as a pilgrim he comes to us and takes us up with him in his 'ascent' to the Cross and Resurrection, to the definitive Jerusalem that is already growing in the midst of this world in the communion tha tunites us with his body." It's that time of year again, and today's the day to pick up our palms - safely stored since their delivery in a local walk-in refrigerator in readiness for this weekend. Palm Sunday, as I suspect everyone knows, is one of the most popular days in the church calendar. The Palm Sunday Mass is certainly among the best attended. It is, in fact, not only a great introduction to Holy Week but is actually a kind of compendium of it, since (in addition to the Blessing of Palms and Procession) it includes the solemn proclamation of the Lord's Passion, which tells virtually the whole Holy Week story. So someone who pays attention on Palm Sunday hears the Holy Thursday and Good Friday stories too. It is, however, undoubtedly the palms that remain the day's biggest attraction. I can well remember my mother carefully weaving crosses of palm to be reverently attached to the crucifix or some other sacred image in every room in our apartment. I can also remember in the first year of Pius XII's 1955 reform of Holy Week - Palm Sunday 1956 - how a neighbor got all upset because he went to an early Mass and got no palms because none would be blessed till the Solemn Mass. That would soon be "corrected" in future years, allowing an anticipatory palm blessing for early Mass goers. But it did capture one of the aims of Pius XII's reform, which was to de-Gallicanize the Palm Sunday liturgy and return it to an older Roman emphasis on the Passion. This was reflected even in the new title the reformed Ordo Hebdomadae Sanctae assigned to Palm Sunday - Dominica II Passionis seu in Palmis ("The Second Sunday of the Passion, or also Palm Sunday"). An American liturgist was once quoted as saying that, in the Roman liturgy, “all the fun things came from Gaul” - a reference to the influence of the medieval “Gallican” rites on the ancient Roman rite. In fact, the traditional Roman Rite, prior to the 1960s, was in many respects really a hybrid of the ancient Roman and the medieval “Gallican” rites. One of those “fun things,” we can thank the “Gallican” rites for is the Palm Sunday procession. Originally, a feature of the 4th-century Jerusalem liturgy, it migrated from there to medieval Europe. The standard Palm Sunday processional hymn, Gloria, laus, et honor (“All Glory, Laud, and Honor”) composed by Theodulph of Orleans around the year 820, is one vestige of that elaborate medieval ceremony. The hymn's length (originally 39 verses) attests to the length of elaborate medieval Palm Sunday processions. It took time, however, for this emphasis on the palms to catch on in Rome. There, the last Sunday of Lent had been focused primarily on Christ’s passion, its distinctive feature not the palms but the chanting of the Passion according to Matthew. Eventually, a missa sicca (i.e., a duplicate liturgy of the word with Matthew’s Palm Gospel), followed by an elaborate blessing of palms and procession, came to precede the Mass at which the Passion was solemnly sung. .Pope Pius XII’s reform of Holy Week radically simplified this, putting the official (if not the popular) emphasis back on the Passion, a development further affirmed in the 1969 Roman Missal now in use. Like so much such bureaucratic liturgical archeologism, however, the attempted change has never really caught on outside the formal rubriics. Hardly anyone (except liturgists) refers to the day by its current official title, "Palm Sunday of the Passion of the Lord." Most seem to stick with its historical and traditional name, "Palm Sunday." And what seems to excite people - to the extent that anything liturgical excites people anymore - is still the palms. As for the long Passion reading, I sometimes wonder whether many perhaps perceive it as yet one more final lenten penance. Seldom anymore do many people get to hear the Passion proclaimed in its unique and dramatic traditional chant, sung by three deacons at three different speeds and pitch levels. Nowadays, many must settle for a monotonic (and often poorly performed) reading, relieved only by the brief pause when everyone gets to kneel at the equivalent of the traditional Emisit spiritum. That pause also qualifies as one of those Gallican liturgical “fun things,” a monastic practice whose diffusion is attributed to Charlemagne's son Lous the Pious (778-840). One of the prayers for the Blessing of the palms in the old (pre-1955) liturgy asked that all who received the palm may obtain protection of soul and body (ut, quicumque ex ea receperint, accipiant sibi protectionem animae et corporis). Another prayed that those who dwell where the palms are brought may obtain blessing and protection from all adversity (in quemcumque locum introducti fuerint, tuam benedictionem habitatores loci illius consequantur et omni adversitate effugata, dextera tua protegat). There are no such expressions in the new (post-1969) Palm Sunday prayers. Even so, the sentiment seems to have survived in the popular devotion that surrounds receiving the palms, taking them home, and keeping them there throughout the year. I don't weave palm crosses myself. But, in the absence of anyone to weave one for me, I still keep at least a plain branch of blessed palm in sight all year long. Many in our society today label themselves "spiritual but not religious." Perhaps we might well label the popularity of Palm Sunday as "religious but not liturgical"! My guess is that most people in Jericho generally ignored Bartimaeus as much as possible. That we now know the name of this last person healed by Jesus before his own passion and death [Mark 10:46-52] might mean he later became a familiar figure in the early Church. But that was way off in the future when Jesus passed through Jericho on his last trip to Jerusalem - an exciting, glamorous occasion for the locals, not unlike a presidential candidate's campaign event. To make sure he got noticed, Bartimaeus made a nuisance of himself: "Jesus, Son of David, have pity on me." The crowd, of course, tried to shut him up - until Jesus did just the sort of thing he was becoming famous for doing. No doubt to the chagrin of his disciples, who were probably enjoying the parade and their part in it, Jesus stopped to pay attention to some nobody. Had Jesus been a modern political candidate, he'd have had an advance man - or team of advance men - precisely to prevent such things from happening! Notice, however, how quickly the crowd got with the program. Unscripted events have a certain popular appeal all their own. As soon as the people realized that Jesus was actually interested in Bartimaeus, suddenly their scolding turned to encouragement. Jesus' question, "What do you want me to do for you?," was the same one he had asked James and John shortly before. But what a difference in response! The answer they gave was what one would expect from two young, talented, upwardly mobile disciples, just beginning their careers. Poor Bartimaeus simply said, "I want to see." Beggars, as is said, can't be choosers. So they ask for what really matters. James and John's request reflected their greed. Bartimaeus' request reflected his need. In his closest companions and dearest disciples, Jesus found demanding ambition. In Bartimaeus, he found faith. Homily at the Downtown Cooperative Ministry Lenten Ecumenical Service, Immaculate Conception Church, Knoxville, TN, March 20, 2013. The story could have ended there. But, in spite of Jesus' instruction, "Go on your way," Bartimaeus did no such thing. Instead, he followed on Jesus' way. Having himself found healing and salvation, he wanted to share what he had found with others. Bartimaeus seems to have understood immediately what the other disciples, for all their quality time with Jesus, still failed to grasp - that God's gifts are given not just for themselves, but are meant to be shared with the whole world, this world which God loves so much that he has chosen to become a part of it. Like Bartimaeus, we too have been changed - and challenged - by the transforming power of Christ in our lives. Like him, we too now have to live that change, in our everyday lives, in the wide and complicated variety of situations in which we find ourselves - as family members, students, workers, and citizens. For, in the end, as is so often said, we - individually and as a Church community - may be the only experience of Christ many people will ever have in life, the face of Christ they will see, the word of God they will hear. So if we fail the Bartimaeus test, if we fail to become credible and inviting witnesses, then we run the risk of concealing rather than revealing the face of Christ; and the word of God may seem strangely silent, precisely when and where it most needs to be heard. The love of God may appear absent, if it is't being shared. I'm reminded of St. Catherine of Sienna's remark, back in the 14th century: "Preach the truth as if we had a million voices, for it is silence that kills the world." Of course, it's easy to settle for less. The crowd in Jericho was content to keep Bartimaeus quiet on the side of the road, quite literally in the dark. But, by not playing his prescribed part, Bartimaeus enabled them to experience truth and grace way beyond the limits of their expectations - truth and grace to be shared with all - the only alternative to a future spent in darkness. In the dark, Bartimaeus symbolizes what we are on our own. Following Jesus, Bartimaeus exemplifies the community we can become through the healing, forgiving, and transforming power of Christ present and active in our world. The crowd in the gospel got the message. Once they realized what Jesus wanted, they stopped hindering Bartimaeus and instead helped him to follow Jesus. The truly happy ending of this story will be when we too do the same. Ten times, the Book of Numbers tells us, ten times already the people put God to the test. The story sounds like what my generation would call “ a broken record.” Again and again and again, the people want this, the people want that – until it literally bites them back. Repentance requires turning oneself around. To help them do that, Moses mounted an image on a pole for the people to look at, to help them focus finally on something other than themselves. Our world further feeds our obsession with ourselves. There are advice columns, self-help books, therapists, life coaches, personal trainers, old media, new media – and heaven knows what else – all focusing us on ourselves. But the lesson learned in the desert is that forgiveness and freedom and salvation are ours when we look away from ourselves, when – as Jesus explained – we turn away from our sins and turn to Christ on the cross. As the Pope said just this past Sunday, God “never tires of forgiving, but we, at times, we tire of asking forgiveness.” But, as in the desert, however many times we look the wrong way, Christ calls us to turn to him instead. There, those who had been bitten looked up at the image on the pole and recovered. And so it is with us, when we turn and look instead to our one and only savior, who takes us out of ourselves, as only he can. And through that simple movement of letting ourselves be turned around – which is what the sacrament of penance is all about - we too find forgiveness … and freedom … and salvation. Homily at the Lenten Penance Service for Immaculate Conception and Holy Ghost parishes, Immaculate Conception Church, Knoxville, TN, March 19, 2013. In 1851, a group of Redemptorist priests (among them the relatively recently ordained Isaac Hecker, the future founder of the Paullist Fathers) sailed from Europe to the U.S. to start and English-speaking Redemptorist mission band – a group that would include three other American Redemptorists, Clarence Walworth, Augustine Hewit, and Francis Baker – the three of them, like Hecker himself, all converts to Catholicism. Delayed by bad weather, Hecker and his companions made a novena to St. Joseph in the hope of arriving in New York by March 19, St. Joseph’s Day. “St. Joseph will have to do his very prettiest to get us in,” the Captain retorted. Then, on March 16, he said “St. Joseph can’t do it – give it up.” But the priests persevered in their prayers. That night the wind changed, and the ship began to speed – at 14 m.p.h.! Finally, after 52 days at sea, the ship arrived in New York - on March 19, and the Redemptorists were soon ready to commence the first English-language parish mission in the U.S., at St. Joseph’s Church in Greenwich Village, in Manhattan. (The story of the voyage is told by Walter Elliott in chapter 23 of his 1891The Life of Father Hecker). How fitting that 150 years later, as the Church focuses her energies on a new evangelization, a new Pope – the first from the New World, the first non-European in over 1000 years, and the first member of the great modern missionary Jesuit order - formally inaugurates his ministry as Successor of St. Peter on this feast of St. Joseph! In anticipation of Pope Francis’ Inaugural Mass as Bishop of Rome and Universal Pastor of the Church, the new papal coat of arms (pictured here) has been revealed, an adaptation of his earlier episcopal coat of arms (see below). 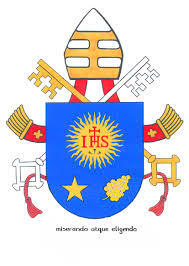 The shield, now surmounted by a miter and the crossed keys of St. Peter, includes the emblem of the Jesuits – a bright sun with the monogram HIS in its center and a cross above and three nails below the monogram. Below the Jesuit emblem, on the heraldic right side of the shield (the left side from the viewer’s perspective) is a star, symbol of Mary. Opposite the star on the heraldic left is the spikenard plant, which in Spanish tradition is a symbol of St. Joseph, the Patron of the Universal Church, on whose feast day the new Pope will celebrate his inaugural Mass. Apparently, the young Jorge Bergoglio felt he had had a special experience of God’s loving mercy calling him to religious life in the Society of Jesus. Years later, in remembrance of that experience of religious calling, when he was to be ordained a bishop Bergoglio chose those words from St. Bede as his episcopal motto. They remained on his episcopal, then cardinalatial (see below), and now papal coats of arms. I think those words from St. Bede serve as a vivid reminder - not just to members of religious communities concerning their particular vocations - but to all in the Church, that we are all who we are and able to do whatever we do thanks entirely to the uniquely merciful way God looks on us and empowers us to collaborate with him in the advancement of God's kingdom on earth. That's a very good starting point for thinking about the New Evangelization, which is first of all premised on our gratitude for God's mercy to us and our readiness to imitate Jesus in "his merciful understanding" of our fellow men and women. "The Teacher is here and asking for you"
The altar crucifixes, statues, and other sacred images are all veiled in purple today. Until relatively recently, this 5th Sunday of Lent was called “Passion Sunday.” With just 2 weeks to go till Easter, today marks the beginning of the final phase of Lent, as the Church focuses our attention more and more on the final events of Jesus’ earthly life – and why those events matter for us today. The gospel [John 11:1-45] we just heard recounts the final miracle of Jesus’ public life – miracles John’s Gospel calls “signs” because they serve to reveal Jesus and invite us to respond with faith in him. But the raising of Lazarus also had as a consequence the authorities’ decision to have Jesus executed. So life and death are mixed together in this story – as the same event that suggests the new life Jesus makes possible for us also results (on the part of his enemies) in a decision for death. The 1st Pope from the New World, the 1st from Latin America (where almost half the world's Catholics actually live), the 1st from the "Global South" (where the Church is vibrant and growing, but where the overwhelming majority of people are poor), the 1st Jesuit ever to be elected Pope, and finally the 1st Francis - it's a very long list of "firsts." Much energy will be expended in the days and weeks and months to come unpacking the larger, long-term meaning of those "firsts." Certainly, it seems timely for a Latin American pope. What a joyful moment this is - not just for the 501 million Catholics that live in Latin America and for the Latino immigrants who are forming the future of the Church in the United States, but for the whole Church, whose universality has again been demonstrated and displayed to the world, as the first non-European in more than a millennium assumes the throne of St. Peter. Then there is his chosen name - so evocative of the famous saint of Assisi. To his contemporaries, St. Francis of Assisi (1181-1226) seemed to personify more closely than anyone else what Jesus was about. (That identification was further confirmed in popular opinion two years before Francis's death by the unprecedented gift of the stigmata). St. Francis permanently challenges us to identify with Jesus Christ, the condemned criminal on the cross. In our affluent developed world, St. Francis permanently challenges us to hear again the Gospel Jesus preached as good news to the poor (Luke 4:18). What we know about Pope Francis' life and ministry in Argentina certainly suggests that message is close to his heart and will likely be a focus for his pontificate. St. Francis sought to fulfill the mission he received from the crucifix at San Damiano to rebuild the Church. What Francis was about was “New Evangelization” – to meet the needs of the 13th century. With St. Francis as a model, Pope Francis will now lead the Church in another “New Evangelization” – to meet the new needs of the 21st century. Our secular culture tends to romanticize St. Francis. But his time was a troubled one – a time full of social and political problems, international conflicts, and trouble within the Church itself. St. Francis sought to revive the Church by recalling both Church and society to the basics of the Gospel’s message. That is the challenge of the “New Evangelization.” And that, of course, is what Lent – and especially this last part of Lent, traditionally known as Passion Time – is about. So, what starts out as a story about the close human friendship between Jesus and Lazarus’ family and about an unexpected extension of Lazarus’ earthly lifespan, is intended today to focus our attention on what is fundamental for the Christian life - our relationship, here and now, with the Risen Christ and his offer to us of a resurrection similar to Jesus’ own. It’s certainly no accident that the conversation we just heard between Jesus and Martha was the traditional Gospel reading read for centuries at Catholic funerals. Among 1st-century Jews, however, there was one group – the Pharisees (whose beliefs Martha apparently shared) – who believed that someday (when the Messiah came) there would be a general resurrection of all the dead. Jesus’ answer to Martha, I am the resurrection and the life, hinted, however, at Jesus’ own resurrection – something neither Martha nor anyone else would have yet understood, since it hadn’t happened yet and no one was expecting the Messiah to be killed or to rise from the dead ahead of everyone else. We, however, start from Easter, from the fact that Jesus has already risen from the dead, and understand his death (and in fact his entire life) in light of that. Lazarus was brought out of his tomb to resume an ordinary life (and eventually die again). Jesus, however, would rise out of his tomb to live forever. Bystanders had to take away the stone for Lazarus to be able to come out – still bound hand and foot. In Jesus’ case, however, no one would either have to help him out or have to untie him. Christ’s resurrected life is something altogether new and different, the decisive defeat of death and the recreation of our dying old world. Martha’s invitation to Mary, the teacher is here and is asking for you, is addressed to all of us, who must now also address it to a world which so desperately needs to hear what Christian faith professes about our hope. On the evening of his election, Pope Francis, before bestowing his first Urbi et Orbi Blessing, began by asking the Roman people to pray for their new Bishop. Indeed, the whole Church old world and new, north and south, unites in prayer for God's gracious benediction upon the Successor of St. Peter, as he leads the Church in sharing with the world the forever new news of Christ crucified and risen from the dead. 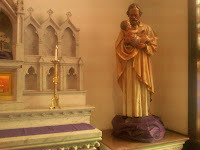 Homily for the Mass of the 3rd Scrutiny of the Elect, 5th Sunday of Lent, Immaculate Conception Church, Knoxville, TN, March 17, 2013. On this date in 1493, Christopher Columbus arrived back in Spain from his first voyage to the New World. The encounter between old and new worlds would henceforth go both ways, which it has continued to do these 520 years. That encounter is heightened now as an Italo-Argentinian assumes the papal throne, bringing back to Europe (and to the rest of the Universal Church) the religious-cultural experience of Latin America, which is itself a creation of the legacy of European Christianity's first evangelization of the New World. Meanwhile, the business of getting back to business has resumed in Rome, although the dramatic conmclusion of this extraordinary conclave period - the new Pope's solemn formal installation as Bishop of Rome and Supreme Pontiff of the Universal Church - is still to come. So today Pope Francis met with his "Senate," the College of Cardinals. Although televised, it was really a rather intimate gathering, very much reflecting the fraternity the cardinals have experienced during this period. The Pope's allocution certainly seemed heartfelt, especially when he seemed to be speaking spontaneously. Heartfelt too were his special words of gratitude to his prececessor, whom he dscribed as having reinvigorated the Church with his teaching, his goodness, his faith, and his humility, a wise and humble man always focused on Christ Risen, present and active in the Eucharist. Everyone takes from these events different impressions - according to one's own expeirences and situation. For me, just 10 days shy of officially becoming a senior citizen, it was particularly moving to hear Pope Francis (who is, of course, a decade older than I) speak of what we might consider a certain spirituality of old age. It is said that only 8% of the cardinals are under 65, which I can't confirm but certainly seems credible. So the Pope was speaking to an audience that should be well disposed to hearing his meassage. "The majority of us are in advanced age," the Pope observed (translation mine, hence totally unofficial). "Old age is - as I like to say - the seat of wisdom about life. The old have the wisdom of having walked through life, like the elderly Simeon and Anna in the Temple. It was precisely that wisdom that made them recognize Jesus. Let us give this wisdom to the young; like good wine, which becomes better over the years, let us give the young the wisdom of life." That's traditionally been what the old were expected to do. Ours, however, is a society which fetishizes youth and novelty. Even more to the point, we are in the process of creating a society that is radically discontinuous with the past - not just the past of 2000 or 1000 or 500 or even 100 years ago, but even the past that my generation grew up in. It requires in effect an act of faith all its own to believe that one's life experience really has produced wisdom worth sharing with the young, whose world is so deliberately deprived of so much of what human beings have for so long valued. But sharing the wisdom of the past is, as Pope Francis suggests, a duty incumbent upon us. And that too is part of the new evagelization! "You know that it was the duty of the Conclave to give Rome a Bishop. It seems that my brother Cardinals have gone to the ends of the earth to get one... but here we are... I thank you for your welcome. " With these words, the 76-year old, Jesuit Archbishop of Buenos Aires, Jorge Mario Cardinal Bergoglio, now Pope Francis, stepped out not just onto the loggia of St. Peter's Basilica but onto the world's stage. The 1st Pope from the New World, the 1st from Latin America (where almost half the world's Catholics actually live), the 1st from the "Global South" (where the Church is vibrant and growing but where the overwhelming majority of people remain poor), the 1st Jesuit ever elected Pope, and finally the 1st Francis - it's a very long list of "firsts." Much energy will be expended in the days and weeks and months to come unpacking the larger, long-term meaning of those "firsts." As I wrote yesterday, it is more than about time for a Latin American pope. What a joyful moment this is - not just for the 501 million Catholics that live in Latin America and for the Latino immigrants that are forming the future of the Church in the United States, but for the whole Church, whose universality has again been demonstrated and displayed to the world, as the first non-European in more than a millennium assumes the throne of St. Peter. Then there is his chosen name - so evocative of the poverello of Assisi.In the near-term, I think the new pope's choice of name may speak most eloquently to today's world. St. Francis of Assisi (1181-1226) is one of the Church's most famous and most widely loved saints. To his contemporaries, St. Francis seemed to personify more closely than anyone else what Jesus was about. (That identification was further confirmed in popular opinion two years before Francis's death by the unprecedented gift of the stigmata). In our affluent developed world, St. Francis permanently challenges us to hear again the Gospel Jesus preached as good news to the poor (Luke 4:18). What we know about Pope Francis' life and ministry in Argentina certainly suggests that message is close to his heart and will likely be a focus for his pontificate. St. Francis sought to fulfill the mission he received from the crucifix at San Damiano to rebuild the Church. 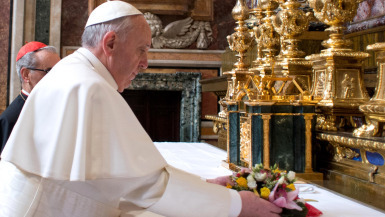 What Francis was about was “New Evangelization” – to meet the needs of the 13th century. With St. Francis as a model, Pope Francis (pictured above making his first visit to the Papal Basilica of St. Mary Major) will now lead the Church in the “New Evangelization” – to meet the new needs of the 21st century. Well, I guess my parochial vicar called it right in his prediction that the conclave would be over in two days! So much for all the speculation about deadlock! As far as I know, however, in all the recent speculation hardly anyone was particularly predicting the 76-year old, Jesuit Archbishop of Argentina, Jorge Mario Cardinal Bergoglio, now Pope Francis, whose first public words to the world were: "You know that it was the duty of the Conclave to give Rome a Bishop. It seems that my brother Cardinals have gone to the ends of the earth to get one... but here we are... I thank you for your welcome. " Latin Americans represent 42% of the Church's population worldwide. So it is more than about time for a Latin American pope. What a joyful moment this is - not just for the 501 million Catholics that live in Latin America and for the Latino immigrants that are forming the future of the Church in the United States, but for the whole Church, whose universality has again been demonstrated and displayed to the world as the first non-European in more than a millennium is elected Successor of St. Peter. Precisely because Bergoglio, now Pope Francis, was such a surprising choice (at least to most of us), the professional analysts on whom we tend to rely so much in the media were obviously much less ready than they might otherwise have been to analyze what his election may mean for specific concerns in the Church - what his election may mean for the new evangelization, for the Church's response to secular modernity, for the Church's identification with the poor, for vocations, for ecumenism and interfaith relations, etc. Substantively certainly, Pope Francis will be on the same page as Pope Benedict was on fundamental doctrinal matters. But that would be true, of course, of anyone who might have been elected pope. What remains to be seen, however, is how the new pope's personality, evident humility and spirituality, his experience, Latin American background, Jesuit formation, etc., will inform his personal style and his papacy's priorities. Meanwhile, our new pope has stepped out onto the world's stage by humbly requesting the faithful to pray for him. O God, who chose your servant Francis in succession to the Apostle Peter as shepherd of the whole flock, look favorably on the supplications of your people and grant that, as Vicar of Christ on earth, he may confirm his brethren and that the whole Church may be in communion with him in the bond of unity, love, and peace, so that in you the shepherd of souls, all may know the truth and attain life eternal (Collect, Votive Mass for the Pope). My parochial vicar is confident this will be a short conclave. I am not quite so certain. But, either way, we’ll know soon enough! Meanwhile, midway into the second day and after three thus far inconclusive ballots, speculation continues. And the longer it goes on, of course, the more speculation there will be about why. Perhaps it is inevitable that a vacuum of actual information invites speculation and gossip. The longest papal selection – in Viterbo in 1268 - lasted over two years, resulting in the modern (i.e.,strictly enclosed) procedure of the papal conclave. 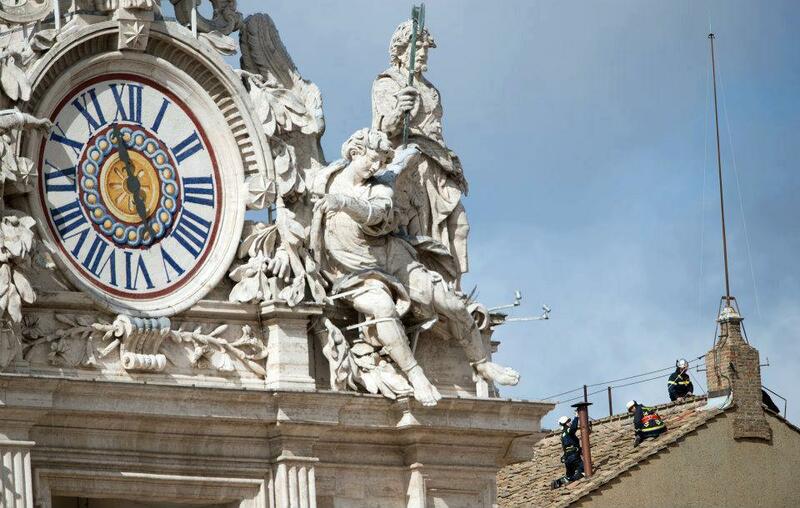 The longest conclave in recent centuries was that of 1740, which went on for 181 days. (Four cardinals died during it!) The 1758 conclave lasted 53 days. The 1769 conclave lasted 94 days. That of 1774-1775 lasted 133 days. (Two cardinals died during that one!) The 1799-1800 conclave, the last outside of Rome (then occupied by Napoleon), lasted 105 days. That of 1823 lasted 27 days. The 1829 conclave lasted 36 days. That of 1831-1832 lasted 51 days. Then the conclave of 1846 – the last at the Quirinale Palace – lasted all of only 3 days. That of 1878 also lasted only 3 days. The 1903 conclave lasted 5 days. (This was the last conclave at which a secular ruler - Austrian Emperor Franz Joseph - vetoed a papal election. It was also the first one at which an American – James Cardinal Gibbons of Baltimore – participated). The 1914 conclave, held during the first month of World War I, lasted 4 days. That of 1922 lasted 5 days. The 1939 conclave took only 2 days. That of 1958 – the first one in my lifetime – lasted 4 days. The conclave of 1963 lasted 3 days. The first 1978 conclave took just 2 days; and,the second 1978 conclave 3 days. Finally that of 2005 lasted a mere 2 days. So, starting in the mid-19th century, conclaves have become significantly – and consistently – shorter. No one seriously expects a contemporary conclave to go on for more than 5 days. (That would be 17 ballots!) Even though the cardinals now come from all over the world and may not all know each other all that well, the presumption is that most of the serious papabili are already more widely known – or certainly have become better known during the interim between the vacancy of the Apostolic See and the start of the conclave. And, of course, the pace of modern life is so much faster today that a lengthy conclave would probably be seen as intolerable to modern sensibilities and would likely project an undesirable image of the Church as very divided internally. Inevitably, as I said above, a vacuum of actual information invites speculation and gossip - all the more so a prolonged (by modern standards) vacuum of information invites speculation and gossip. So the factors contributing to a shorter conclave are many. The only real question then is how short? The 1939 and 1963 conclaves had clear frontrunners, whose accession to the papal throne was widely anticipated. If not quite the obvious frontrunner, Cardinal Ratzinger was in 2005 certainly a frontrunner, certainly the best known and one of the most widely respected members of the sacred college. So his selection was hardly surprising. In retrospect, Cardinal Roncalli in 1958 and Cardinals Luciani and Wojtyla in 1978 were also serious contenders internally, although their elections were certainly not widely anticipated on the outside. Meanwhile, the world waits, and hopefully ma learn something about the virtue of patience in the process! As I wrote yesterday: cut off from the world, the cardinals must make their choice, however long that takes. Cut off from further insider information, we in the world must await their choice, however long that takes.